The Economics Anti-Textbook: Economists and conflict of interest: the documentary "Inside Job"
Economists and conflict of interest: the documentary "Inside Job"
I finally got a DVD of the fine documentary on the 2008 bubble collapse/financial crisis/recession Inside Job, whose website, incidentally, contains a wealth of information. (You can watch the movie for free on YouTube here.) It's very well done and, particularly if you're an American, you should make sure you see it and that your library has a copy. 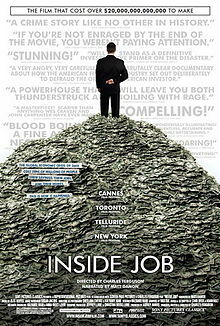 The movie shows the deep corruption in the financial industry and, in turn, its corrupting influence on the political and regulatory system, with very costly consequences for the society -- nothing there was really new to me. 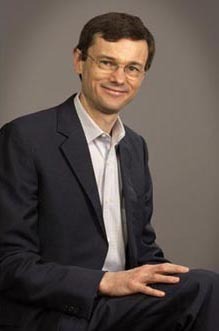 When the question of 'conflict of interest' comes up, Hubbard, the Dean of Columbia Business School says that when people do research they should disclose whether there would be a financial conflict and then (laughably) claims that "there would be significant professional sanctions" for failure to put such a thing in a paper, although he does not dispute that there is no policy in that regard. The filmmakers then ask Frederic Mishkin (Hubbard's colleague at Columbia Business School) about a paper he wrote (and was paid $124,000 to write), touting Iceland's "financial stability". He did not indicate in the paper that he was paid to write it. If there were "significant professional sanctions" applied to Mishkin, the filmmakers forgot to mention it. At 1:30 in the film, John Campbell, the chair at Harvard, declares that he sees no reason why faculty members should disclose who is paying them money for consulting, being on Boards of Directors, and so on. They come back to him at 1:32:30 and ask him a question that leaves him literally unable to reply. You have to see it for yourself, if you haven't already. But the influence of business on economists, particularly those in business schools, runs deeper than just who is getting paid how much to consult, write papers or serve on Boards. The institutions themselves wallow in corporate money and in Canada many of them have even sold their names to rich businessmen or companies. Are these places from which we can expect a critical analysis of the role of business in society?